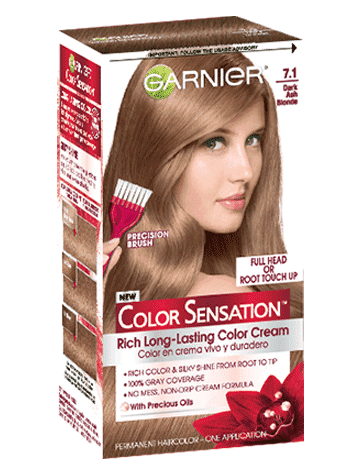 Rated 5 out of 5 by Paola from Love it I really love this color, is the only one that takes away the orange of my hair in to a nice ash blonde. Please do not take this product away. Rated 1 out of 5 by sfen from Hair also turned almost black I too wish I had seen the reviews! I have dark blonde hair with some gray. I bought Color Sensation 7.1 Dark Ash Blonde and my hair is now dark brown/black! I look ridiculous and have an important function this weekend! I don't even want to go to work! I can understand a slight difference, but this is extreme! Angry, frustrated and embarrassed. This product should not be on shelves! Rated 3 out of 5 by buffy003p from very dark I did not read the reviews and I have the same results, dark brown hair. I realize it will lighten up after a few washes, was a shock. I liked the brush on feature, my grey hairs are totally covered, it did dry my hair somewhat so I need heavy conditions to add shine and body. I think I should go back to professional colorists to avoid the drastic color change I ended up with. Rated 1 out of 5 by Pammy57 from Hair turned black Wish I had read the reviews also. Hair is so dark now. Will not buy another Garnisr product! Rated 1 out of 5 by Very upset from Black hair! I am blonde or was until today! How can u sell a product that is called Ash Blonde and turns blonde hair BLACK!?! Called some hairdressers and corrective coloring runs about $200! This is so wrong! You need to fix this! Rated 1 out of 5 by Rj of FV from Ash Blonde I used this Ash Blonde over my very blonde hair, except for my dark roots. It came out almost BLACK! I am very disappointed. I hope I can get it lightened before any body sees me. Yikes! Rated 1 out of 5 by Jessicaw342 from Doesn't lighten hair Started with auburn hair and ended with dark brown hair darker than my own hair. Rated 1 out of 5 by Bamakitty from Ugh!! Do not buy unless you want dark brown with a hint of black hair! Wished I had looked at reviews first. I just about cried when my color turned dark I don't look good with dark hair my skin is too light!